These Chicago venues are perfect for pre- and post-convention gatherings. From historic industrial buildings that once housed automobile showrooms to charming Victorian mansions with intricate architecture to brand-new breweries famous for innovative craft beer, event planners will discover plenty of options for unforgettable Chicago events just steps from McCormick Place. Industry. Innovation. Inspiration. Revel Motor Row is a remarkable venue close to McCormick Place that taps into Chicago’s rich history, located in the 1936 landmark building that was once home to the Illinois Automobile Club and The Chicago Defender newspaper. The adjacent building once housed the city’s first Cadillac dealership, which is now known as The Garage, offering even more event space. With 50,000 square feet of total event space, a 4,000-square-foot outdoor courtyard and 12-20 spaces for breakout rooms and private dining, this versatile venue can accommodate an array of events for up to 2,600 attendees. History and craft beer seamlessly intermingle at Motor Row Brewing, a brewery located in a historic building in the Motor Row District, featuring exposed brick walls, vintage-style lighting and an industrial vibe. Take your pick from three private event spaces, or rent out the entire building for larger events. The first-floor brewery bar can accommodate 10-30 guests; the second floor taproom accommodates up to 50 guests reception-style (or diner seating for 30); and the third floor can accommodate up to 100 guests reception-style (80 seated dinner). 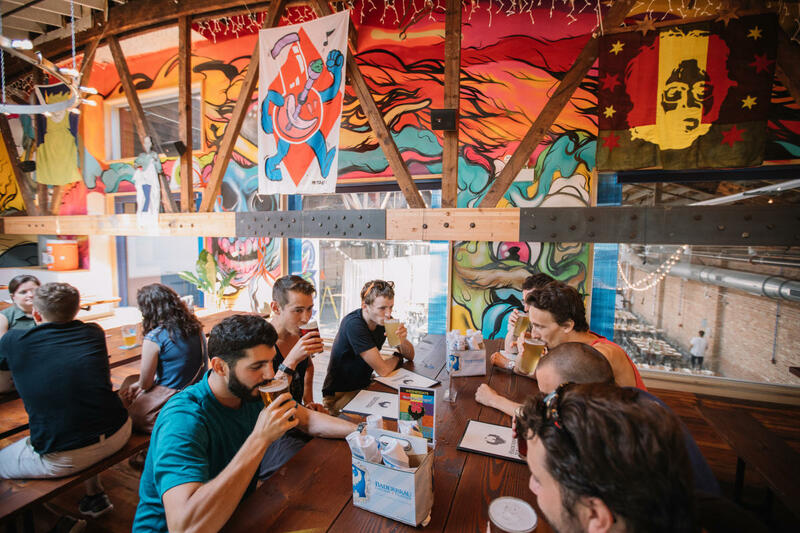 Add a brewery tour to your event for a fun, interactive experience. Another historic gem in the Motor Row District, this lofted venue boasts 5,000 square feet of flexible meeting space. The former sales room of one of America’s first car manufacturers, Motor Row Galleries harnesses an urban, vintage vibe with historic fixtures, high ceilings, tile floors and an open floor plan. Street, private lot and valet parking options are available. Near the burgeoning Motor Row District, Baderbräu touts a lineup of freshly brewed craft beer, from the crisp Chicago Pilsner to the malty South Side Pride. This brewery also offers an expansive private event space with exposed brick walls, wood beams and natural lighting via an elongated skylight. The private taproom accommodates 900 guests cocktail-style (350 seated), and for larger events the entire building or brewery may also be rented. Pre-made catering packages make food and drink options easy. A rockin’ music club, restaurant and record shop, Reggies is the ultimate destination for music fans. Rent out the entire Reggies Rock Club music venue, or for smaller groups reserve just the balcony lounge. The 99-person rooftop deck is perfect for casual outdoor events, outfitted with flat-screen TVs, a pool table and bar games. Reggies’ Kitchen offers on-site catering options such as wings, char-grilled burgers and ribs. For convenient transportation from McCormick Place, book one of Reggies’ vintage buses to bring your group to the venue. Though it’s located just steps from McCormick Place, this National Historic Landmark building feels a world away. Row 24 is located in the former 1903 Speedwell Motor Company Showroom. Yet it touts an elegant 1920s aesthetic, with a Swarovski crystal chandelier, soaring 20-foot ceilings and exposed brick walls for your event of up to 300 people for a cocktail reception and 225 for a seated dinner. After a two-year renovation, this iconic restaurant housed in a former fire station in the South Loop has reopened its doors, unveiling a timelessly elegant space harnessing vintage glamour. 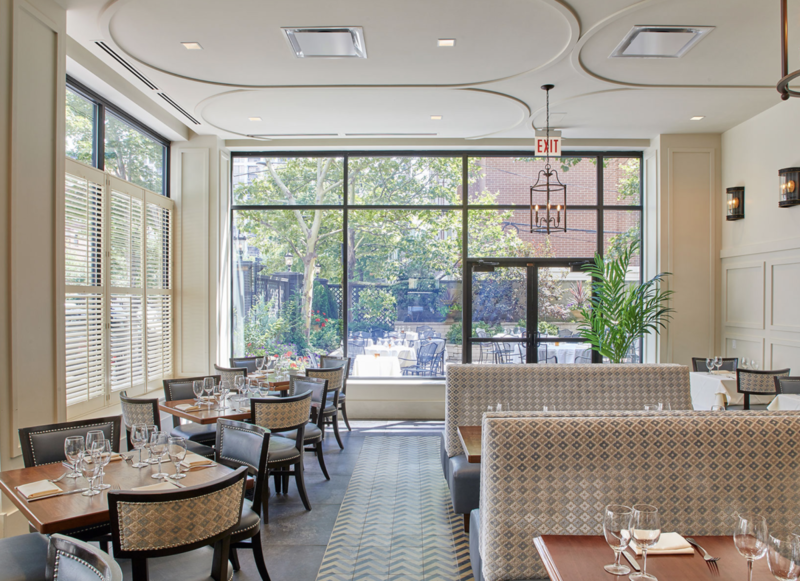 The Chicago Firehouse Restaurant is equipped for hosting events of all sizes, with private rooms ranging from intimate to grand. Choose from spaces such as The Palmer Parlor (100 cocktail/64 seated), The Kimball Parlor (75 cocktail/48 seated), The Mayor’s Room (25 cocktail/20 seated), The Solarium (75 cocktail/40 seated), The Second Floor Veranda (70 cocktail/40 seated) and The Patio (80 cocktail/30 seated). Pre-set catering menus include elegant dishes such as grilled swordfish, rack of lamb and New York Strip. An eclectic event venue with hardwood floors, mosaic tile, built-in marble bars and lofty ceilings, 19 East is a visually stunning venue that’s ideal for contemporary events. Rent one of the spaces for an intimate gathering or combine spaces for a larger, multi-level event. Run by the catering and special event experts at Food For Thought, 19 East can accommodate up to 500 for a reception or 250 for a seated dinner. Located just three blocks from McCormick Place in the South Loop’s Prairie Avenue Historic District, The Keith House is a stately 1870s Victorian-style mansion. Choose from three elegant event spaces: the art gallery, the parlor or the dining room, accommodating up to 40 people for a meeting in one room or 90 for a cocktail-style reception. Also in the Prairie Avenue Historic District, this National Historic Landmark was designed by Henry Hobson Richardson and was completed in 1887. 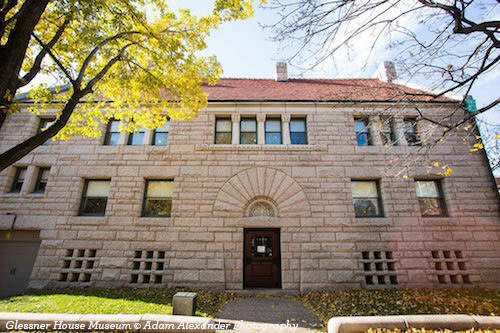 The Glessner House Museum touts numerous spaces for private events: The Courtyard (200 cocktail/150 seated), The Coach House (125 cocktail/100 seated), The Dining Room (50 cocktail/40 seated) and The Conservatory (40 lecture/20 board room). Arrange for a customized private tour of this architectural gem to give your attendees a glimpse into Chicago’s past. Find even more event venues in Chicago.